Classics in the Courtyard is back! 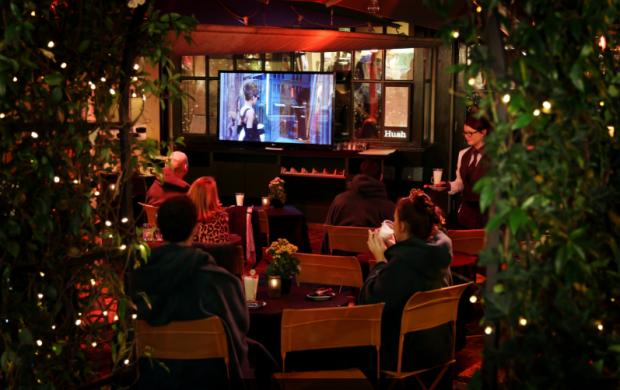 Once again, our season of al fresco film screenings returns to our iconic cobbled courtyard every Sunday from 6.30pm. Cosy up with our signature blankets, Hush Toddies and complimentary popcorn, and enjoy our full A La Carte menu throughout the night. For 2017, we’re delighted to announce some new features for you to enjoy! This holiday season we’re bringing a “Fairytale of New York” to our Mayfair courtyard, screening New York festive favourites Breakfast at Tiffany’s and Wolf of Wall Street, before slipping into the likes of Elf and Home Alone 2:Lost in New York, to get you into the Christmas spirit. Look out for our Manhattan inspired cocktails and specials in partnership with The Pogues whisky. Join us for festive fun at 6.30pm on Christmas Eve with a special screening of Love Actually– the perfect way to welcome in the holidays! So, this winter banish the blues and head to Hush, where Classics in the Courtyard will ring in the cheer all season long.